I gave this book 5 stars. There is almost nothing I love more than mythology. I just find it so fascinating and exciting, which is why it was a no brainer for me to read this book. I really flew threw the second half of it this morning. This book was just so much more exciting than if I had just decided to research all of it online. 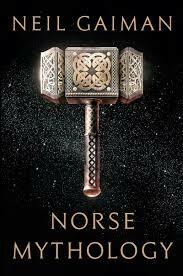 This book had soul, unlike others's retellings of Norse Mythology. This was the first book I've ever read by Neil Gaiman and I have to say, I'm really impressed. If it had been any other author writing this, I might not have been as engaged as I was. I liked the characters, I felt like they were very accurately portrayed in this book. The Gods were so outrageous. Their thought process was just so outlandish to me. They were also really stupid at times, like when they told others of their weaknesses because they were just so arrogant as to think they were above it all. Also, Loki, that little trickster. I need him in my life. To me, it felt like he was the only one in the book that wasn't an idiot and that was why everyone considered him all clever. It wasn't because he was really smart, it was because the gods were kind of idiots. They were also very casual about losing limbs. Baldur didn't even seem to care about losing his arm. Absolutely ridiculous. Also Odin, he fricken just jumped into Fenrir's mouth?! Why? I'm just at a bit of a loss because of these stupid gods doing stupid things. I would recommend this book to everyone. Even if you don't generally like mythology, I think you would like this book. It's a fast read, a collection of these short stories, easy to just take breaks in between if you so feel like it. It isn't heavy.